I don’t often take joy in my music the way I don’t take sugar in my coffee. I like my jazz and I like my soul as raw as possible. But after listening to their new CD, “The Full Catastrophe,” a few times in the car, I couldn’t help but sing along with the Nields, that perpetually upbeat folk sister duo. Recipients of the Iguana Grant for these songs, the Nields will be paying it forward for audiences at Club Passim Friday night, Nov. 15 and at a family show the following morning. There’s variation in the pace and harmonies of these tracks, but not their infectious joy. You may think domesticity banal, not the stuff of great passions or great art, but it provides the Nields with an endless well of inspiration. “I don’t need the good life / I just need life / The full catastrophe,” they belt out in a refrain that may not appear as weighty as it is at first blush. "Full Catastrophe" is a reference to Zorba the Greek, who put it this way: "I'm a man, so I married. Wife, children, house, everything. The full catastrophe.” The Nields certainly don’t wear rose-colored glasses: “They say the hours drag but the years fly by / Somedays it’s hard to find a moment to ask why / We think we’re in it for the memories / But I’d trade in all my scrapbooks for an hour more of sleep.” But family life is the fodder for their work. It’s profound stuff. Many people do not believe that family, home, cozy love and hearth can provide the wellspring for art. Well, just why can’t they? It’s a feminist conundrum. So often women are associated with these “feminine” realms that escaping them appears to be the only true path to serious work. And often as artists, women have been confined to subjects considered “natural” for them. Need I really list those? The home has gotten a bad rap for being an inhospitable place for art, and for female artists, in particular. 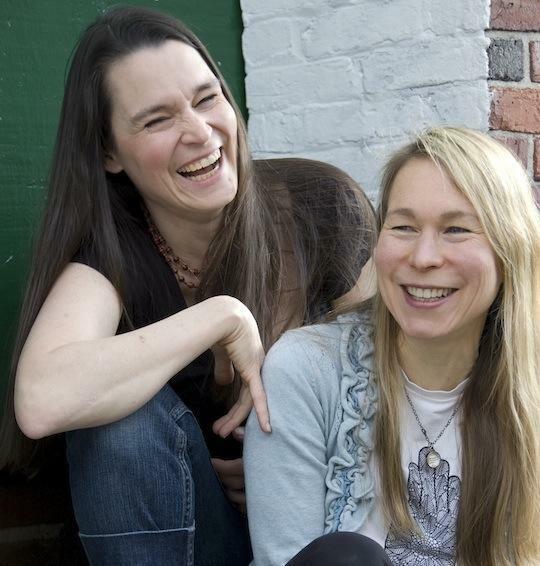 But perhaps we should take a page from the Nields, who turn the daily grind into fluid music? Too often “the artist” has been conceptualized as a lone (male) visionary, unencumbered by domestic burdens. On the contrary, Nerissa and Katryna Nields draw from motherhood to make music. Their residency is their family, and it works for them. After 20 years of singing, writing, and performing, the Nields have smoothed most of the edges of their sound (but not all), replacing busy lyrics with, as Nerissa puts it, “a more spacious sound” that gives her sister the opportunity to hold her notes and linger. That spaciousness will fill out the one room wonder that is Club Passim, certainly. When Katryna sings “Good Times are Here, Johnny,” the lilt of her vocals is like an Irish lullaby. Still other tracks, “Which Side Are You On?” among them, roll forward on words like a Kimya Dawson song, but with a voice that can keep up without tumbling. The timbre of their high notes, if not quite so high, recalls Joni Mitchell. They’re cheery, these two, but not Pollyanna. They know that life is hard, and making art while tending to our other obligations, especially as women, is a painful struggle. “But someone has to cut the brambles back / Someone has to stave the weeds’ attack/ Someone has to bring the harvest in.” Sure, the Nields may fantasize about casting off to sea, or replacing obligations with time to write, or simply getting an extra hour of sleep. But then, life and art both are enriched by the full catastrophe. The joy that underwrites their music is a new adage: “Complicate, complicate, complicate.” After all, what’s wrong with an overflowing cup. Robyn Day is a Boston-based photographer and contributing writer at Big Red & Shiny and Art New England. She manages the publicity and marketing initiatives at Lacoste Gallery. This program aired on November 13, 2013. The audio for this program is not available.